Oh, the new year, the fresh start! It's unlikely that you're still running on the new-year high at the beginning of February (if you are, I commend you), but for this round-up, you will need all your energy. If January is any indication of how 2019 will play out, we are in for a ride. Social media companies were very busy last month introducing new features, dealing with PR nightmares and completely changing the strategy of their platform (allegedly). While some social media are going away (R.I.P. Google+), others are testing out the marketing waters. Source of this exquisite art: Manchikoni. A LOT happened in January. So without further ado, let's dive in! Twitter is currently testing out radical changes to the platform and it's doing so in quite a radical way as well! As reported by TechCrunch, to test out new features Twitter will give a group of users access to a stand-alone app which will have the new features. The app is specifically dedicated to testing out experimental features that might (or might not) be implemented on Twitter in the future. We want to develop a service for the people that are using it, and we have to involve people in that way. We have a platform that the world uses to speak their mind, why not use that as part of our development process? One of the changes to Twitter UI, which selected users will be testing, is differently coloured replies in conversation threads, meant to separate replies from the author and people you follow from the rest of the replies. The person who posted the original tweet will also have their own replies in the thread highlighted. When you click into a conversation thread, the beta app will also offer visual cues to help you find the parts of the thread that are of interest to you. Twitter replies are already shown in a specific order: replies to which the author of the original tweet responded as well as replies from the people you follow are shown at the top. Now, those replies and the branches of conversation that come off them may become easier to follow, also based on algorithms. A later test may involve a version of Twitter’s Highlights, i.e. summaries of what it deems important, coming to longer threads. There is still a possibility to like, retweet or reply to a tweet, but the icons will only appear when you tap on a specific post. Evidently, Twitter is putting the focus on conversations. I hope one day to see the option to subscribe to certain threads to completely break free from person-oriented social media, but until this day, I'm glad Twitter is taking some bald and yet transparent steps towards the new understanding of the platform. Twitter execs point out that they are trying to design a platform around the user's behavior, i.e. add features which are actually necessary for users. That's quite admirable, and we will see how it changes the platform going forward. As Twitter is trying to attract more brands, they announce new features to provide more marketing insights powered by data. The goal is to let brands join trending discussions in real time. The first feature is an activity tracker which would give you insights on when your Twitter audience is most active on the platform. The idea is to offer publishers an easy way to see who on Twitter is reading and engaging with their content, when they’re viewing it, and what content is working best. The Events Dashboard will provide real-time analytics for major events and breaking news. Twitter already provides a major Events listing with similar info for advertisers, but this new tool would highlight the information as it happens, as opposed to presenting retrospective data. These additions are unlikely to be the last — during the same presentation, Twitter revealed their intention to design a new publishing dashboard and rethink the way they currently present Events on the platform. Twitter has already begun taking small steps in this direction by adding social context (a listing of how many users are engaging with an event in real-time) to Events pages; however, they are looking to make much more significant changes. Twitter aims to make it easier for newcomers to follow events, without the need of knowing the hashtag. The planned “Events section” will organize this information for you, so you can “tune in” to the live events without having to know who or what to follow. Let me call it right there: 2019 will be the year when social media make social responsibility the main focus of their platforms. Nowadays, social media is one of the biggest sources for fake news, bots, dishonest growth tactics, and other sketchy business. We have suspended these three apps for having repeatedly violated our API rules related to aggressive following & follow churn. 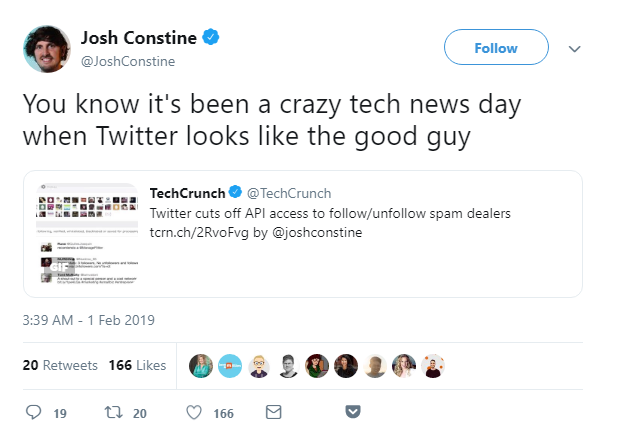 As a part of our commitment to building a healthy service, we remain focused on rapidly curbing spam and abuse originating from the use of Twitter’s APIs. 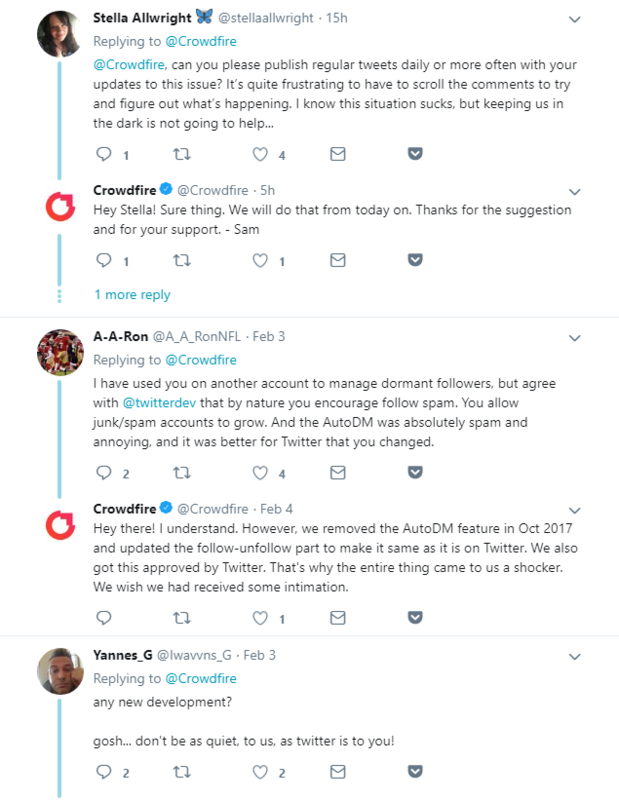 The three tools that had their API access cut (Statusbrew, ManageFilter, and Crowdfire) still haven't heard from Twitter by the time I'm writing this article. Perhaps, an even more important event in the history of social media is the outcome of a court case against American company Devumi. This company provided fake social media followers, engagements and comments to a range of celebrities and influencers. Devumi sells Twitter followers and retweets to celebrities, businesses and anyone who wants to appear more popular or exert influence online. Drawing on an estimated stock of at least 3.5 million automated accounts, each sold many times over, the company has provided customers with more than 200 million Twitter followers, a New York Times investigation found. The decision of the trial basically deems selling fake followers illegal. As you see, the public and the social media executives both agree that social media platforms require policy changes regarding misuse and manipulation made possible by functionalities of the platforms. With upcoming USA elections, social media there will be even more pressure to prevent misinformation and fake news. We will see how successful they will be. You know you really messed up when Apple is angry with you. Last week TechCrunch reported that Facebook was paying users to collect their personal data by “Facebook Research” app available in app stores on Android and iOS. The app monitored all of a user’s phone and web activity, even asking them to take screenshots of their Amazon order history page. The program was administered through beta testing services Applause, BetaBound, and uTest. Even though users voluntarily agree to participate in the program, the wording of the agreement is quite ambiguous and makes it unclear what type of data exactly is collected and how it’s used. The type of data the app could collect includes private messages in social media apps, data from messaging apps (including photos/videos sent to others), emails, web searches, web browsing activity, and even ongoing location information by tapping into the feeds of any location-tracking apps you may have installed. After the release of the article, Apple blocked "Facebook Research" app from its store, simultaneously halting the work of several other Facebook apps for internal use among Facebook employees. The report by TechCrunch which uncovered this story used strongly-worded phrasing, pointing out that some of the users of the app were not older than thirteen. Not everyone agreed with the sentiment expressed in the article. It’s unclear how all these PR crises affect the company: the latest report showed increases in revenue and usage. However, Facebook is actively trying to be more transparent about their data policies, and Mark himself dedicated his New Year’s resolution to transparency and social responsibility. On the other hand, this month Facebook made an effort to block ad transparency tools from their platform. After all these scandals, I wonder if there will be a controversial enough story to make people actually stop using Facebook. ​​​​​We want to build the best messaging experiences we can; and people want messaging to be fast, simple, reliable and private. We’re working on making more of our messaging products end-to-end encrypted and considering ways to make it easier to reach friends and family across networks. The idea is to be able to communicate with your friends even if you prefer different Facebook products. According to The New York Times, this feature is championed by Mark Zuckerberg itself, even though he made remarks against it in the past. For many members of Generation Z, Facebook is the social network for their parents. According to the reports, the younger demographic is abandoning the platform in favour of other social media. 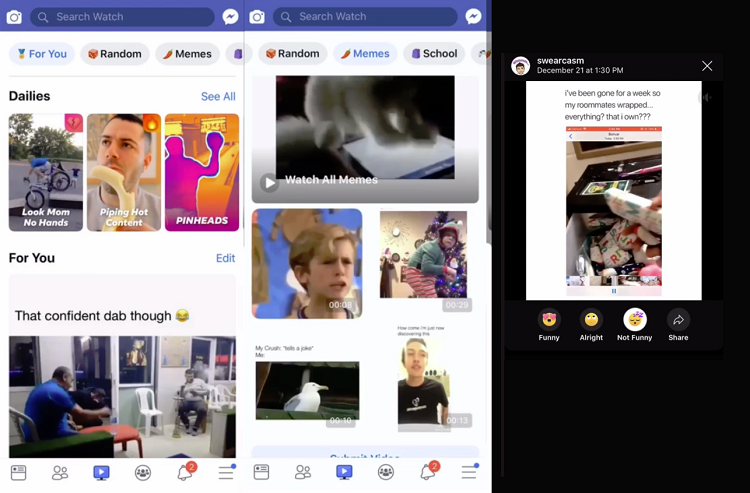 Facebook is aiming to bring back younger audiences by testing out a new LOL feature which is actually just a feed of entertaining content. Facebook has spent months building LOL, a special feed of funny videos and GIF-like clips. It’s divided into categories like “For You”, “Animals”, “Fails”, “Pranks” and more with content pulled from News Feed posts by top meme Pages on Facebook. LOL is currently in private beta with around 100 high school students who signed non-disclosure agreements with parental consent to do focus groups and one-on-one testing with Facebook staff. 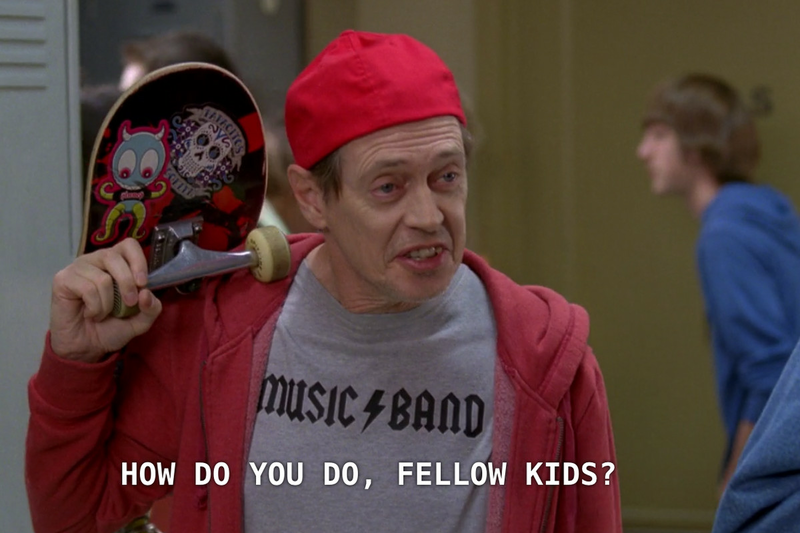 I hardly see how posting week old memes can bring Generation Z to the platform. Facebook had seen a fair share of unsuccessful attempts to become more "hip", but this one seems like an act of complete desperation. Remember when I said that not everyone should be engaging in meme culture? I think Mark and Elon would make good friends. LinkedIn, which is riding the wave of 'record high levels' of engagement, introduces the new initiative to guide content marketing decisions, by highlighting the most popular, most engaging LinkedIn Publisher posts each month. On what it calls the 'Water Cooler', LinkedIn will publish a new listing of the most popular Publisher posts from the previous month. 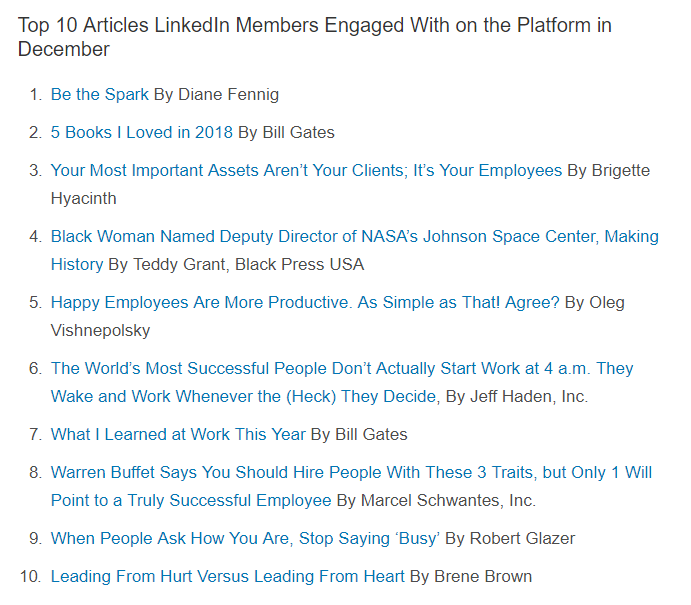 The December list includes posts from Bill Gates and Oleg Vishnepolsky. Interest targeting lets you reach members with relevant ads that match their professional interests — based on the content they share and engage with on LinkedIn. With these added options, you can more easily achieve your campaign objectives and grow your business. Advertisers can choose from over 200 professional interests, like artificial intelligence, global economy, customer experience, and more. LinkedIn has been testing Interest Targeting over the past few months, with customers seeing a 25% increase in click-through rate. Snapchat hasn't been featured in our round-up before for the reason of relative obscurity of the platform. The truth is, Snapchat is popular within a certain demographic, and since Instagram brought ephemeral content to their app, they saw less and less engagement. So, to get on our blog, Snapchat had to do something really big. And they did! 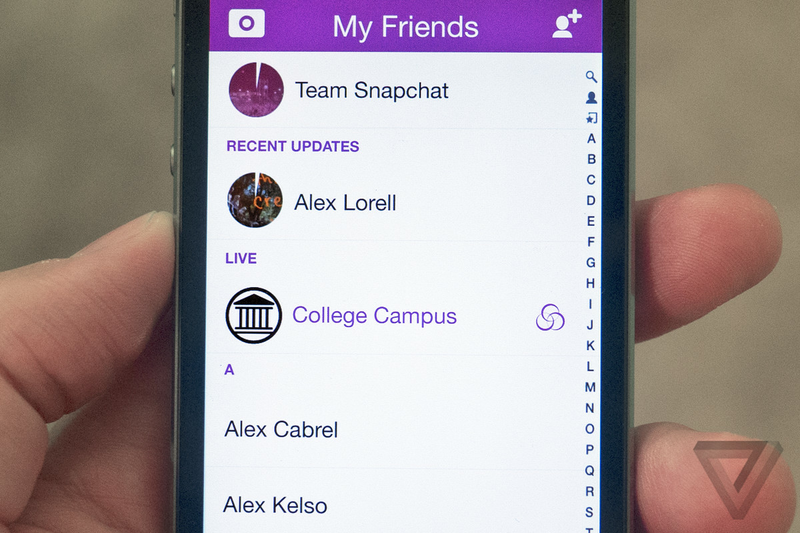 According to the report by Reuters, Snapchat might make their public posts permanent. The company is also considering an option to reveal the identities of Snapchat users who make public posts, who were previously anonymous. Only Snapchat photo and video content shared to “Our Story”, which shares the snaps publicly to a wider audience and not just a user’s friends, would be affected, and users would still have the option of deleting those stories. Last year, Snapchat partnered up with 4 news discovery platforms that help media companies spot, analyze and republish public breaking news content on Snapchat. The turn to permanent content might be motivated by news publishers which want to embed Snapchat posts in their articles. The ephemeral nature of the content (for now, public posts only exist for 90 days) makes it impossible. Snapchat's market value has been consistently going down, so this might be an effort to attract more money. However, considering that ephemeral content is Snapchat's raison d'etre, it's likely that the users won't take these changes favourably. So the first month of the year was nothing like a holiday for social media companies. Some of these events are extremely emblematic of what awaits us in the upcoming year so it's important to keep an eye on them. Let me know what you think will be the biggest trend of this year (not spying on children, hopefully) in the comments!